Acer has announced three new Chrome OS devices for 2018 at the Bett show in London. 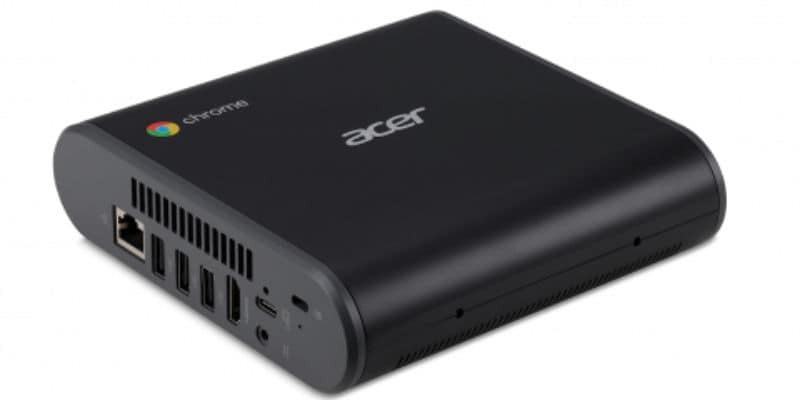 Acer has announced the Chromebook Spin 11, Chromebook 11 C732, and Chromebox CXI3. Similar to most recent Chrome OS devices, these support Google Play as well, allowing them to run Android apps. Acer had recently launched several new notebooks and gaming laptops at CES 2018, and it included a new blue-coloured Chromebook 11. It appears to be the season of Chrome OS laptops, as even Lenovo launched a few education-focused Chromebook laptops on Tuesday. At CES, HP had also announced two Chromebook laptops aimed at the business and education sector. Meanwhile, with the new Chromebook models and Chromebox, Acer promises more durability, a key feature of laptops used in classrooms. Acer Chromebook Spin 11 is positioned as the follow-up to the R11 laptop. It features a 360-degree hinge, two USB Type-C 3.1 ports for charging, data, and connecting external displays, as well as two standard USB 3.0 ports and a microSD card reader. Processor options on the Acer Chromebook Spin 11 include the Intel Pentium N4200 quad-core processor, Intel Celeron N3450 quad-core processor, or an Intel Celeron N3350 dual-core processor. The laptops come with 4GB or 8GB RAM alongside 32GB or 64GB inbuilt storage. The Spin 11 has an 11.6-inch 1366x768 IPS display. It weighs 1.25kg and measures 296x206x19.95mm and 11.65x8.11x0.78inches. Additionally, there is an optional Wacom EMR stylus allowing users to sketch, write, or interact with programs and apps. Several models in the Acer Chromebook Spin 11 line will be available and prices start at $349 (roughly Rs. 22,300). Aimed at education markets, the IP41-rated Chromebook 11 C732 is a durable laptop, says Lenovo. Similar to the Chromebook Spin 11, this laptop also has the same USB ports. However, it has a 180-degree hinge. In terms of display, the Acer Chromebook 11 can be purchased with either an 11.6-inch IPS touchscreen display (C732T) or a non-touch IPS or TN display (C732). The C732 comes with either a quad-core Celeron N3450 or dual-core Celeron N3350 processor. The C732T will be available with either 32GB or 64GB of internal storage coupled with 8GB RAM. In terms of connectivity, the laptop comes with Bluetooth 4.2 and 2x2 MIMO 802.11ac Wi-Fi. Interestingly, Acer says that some regions will also offer models with integrated 4G LTE. The new Acer Chromebook 11 C732 line will be available in March with prices starting at $299.99 (roughly Rs. 19,100) for touch models and $279.99 (roughly Rs. 17,900) for non-touch models. The Chromebox CXI3 is powered by an Apollo Lake 8th generation Intel processor. Connectivity options in the device include a USB 3.1 Type-C port, five USB Type-A ports supporting USB 3.1 and USB 2.0 depending on the model. Launch details are unavailable as of now, though it will be targeted at computer labs and libraries, Acer says.